NOx is a general term referring to Nitrogen Oxide (NO) gas and Nitrogen Dioxide (NO2 ) gas. It forms at the high temperatures of the engine combustion process. NOx is successfully converted to Nitrogen gas (N2) using Selective Catalytic Reduction, or SCR, the most effective technology available today. 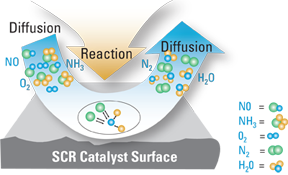 SCR works by promoting a chemical reaction between NOx and ammonia gas (NH3). The ammonia comes from a reductant fluid such as aqueous urea solution, that is injected into the exhaust stream ahead of the SCR catalyst. The heat of the exhaust transforms the reductant fluid to NH3. This chemically reacts with the NO and NO2 at the surfaces of the highly porous catalyst to form nitrogen gas (N2) and water vapor (H2O). The resulting nitrogen gas and water vapor are harmless to health and the environment, and flow through the system and exit the exhaust stack. Carbon Monoxide (CO) and Hydrocarbon (HC) emissions result from incomplete combustion of fuel. Oxidation catalysts, or “oxicats”, are highly effective devices that reduce CO and HC emissions by 90% or more from diesel and lean-burn natural gas engines. Oxicats consist of a substrate made up of thousands of small channels. Each channel is coated with a highly porous layer containing precious metal catalysts such as platinum or palladium. As exhaust gas travels down the channel, HC and CO react with oxygen within the porous catalyst layer to form carbon dioxide (CO2) and water vapor (H2O). The catalyst can also reduce a small amount of Particulate Matter (PM) by converting it to CO2. The resulting gases then exit the channels and flow through the rest of the exhaust system. Particulate emissions (PM) are also a consequence of the combustion process, primarily due to unburned fuel. PM, more commonly known as soot, is removed from the exhaust using a Diesel Particulate Filter, or DPF. The structure of the DPF is similar to that of an Oxicat, except every other channel is blocked with a dense plug. To remove the soot, raw exhaust enters an open channel at the front of the DPF. The walls of the filter are engineered to be semipermeable, allowing gases to pass through but trapping the soot particles inside. The DPF contains a thin layer of catalyst that chemically converts the soot particles to harmless carbon dioxide (CO2 ). This allows the filter to function continuously during engine operation. The catalyst also allows the DPF to function as an Oxicat, reducing HC and CO in addition to PM. Once converted, the gases pass through the filter’s porous walls and into a much cleaner exhaust stream. The Reductant: Ammonia, Aqueous Ammonia or Aqueous Urea? SCR systems work by catalyzing the reduction of NOx with ammonia. The ammonia can be introduced from a variety of sources, including directly as a gas (anhydrous ammonia) or as an aqueous ammonia solution. However, it is more common to use aqueous urea solution as the reductant. A solution made from urea, a common component of agricultural fertilizer, is much safer and easier to handle, and is readily available in several different concentrations and storage capacities. There are advantages and disadvantages to both ammonia-based and urea-based reductants. The AeriNOx SCR System can be designed to use any of these ammonia sources, so please contact us with your requirements for what works best for you.